Formerly Kermès du hêtre (former French name). The beech scale, in association with Neonectria faginata, causes the beech bark disease. 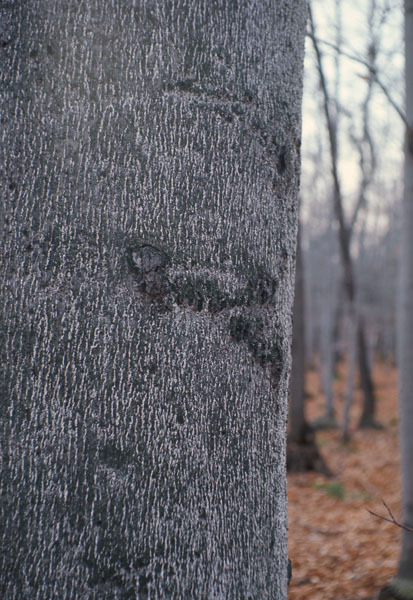 There is no practical control method for beech scale infestations in natural forests. Extremely cold temperatures below -30°C will kill beech scale insects not protected by the snow cover. 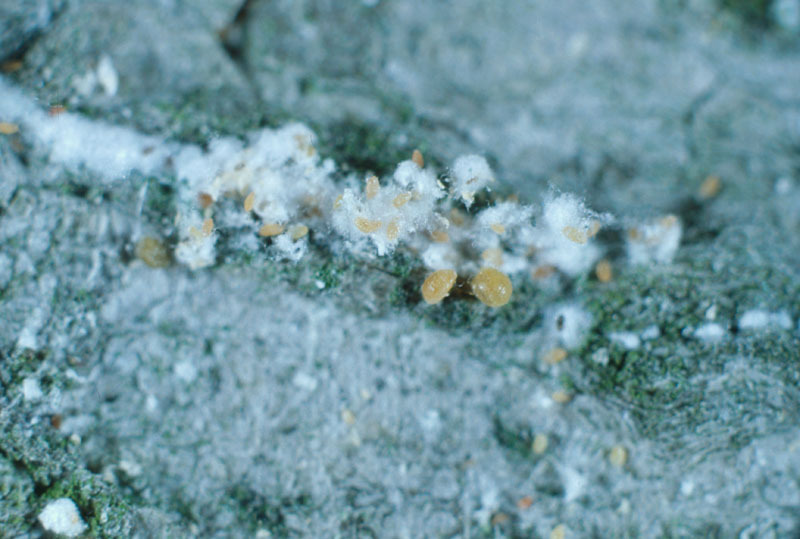 Control measures can be implemented periodically for scale insects on ornamental trees. 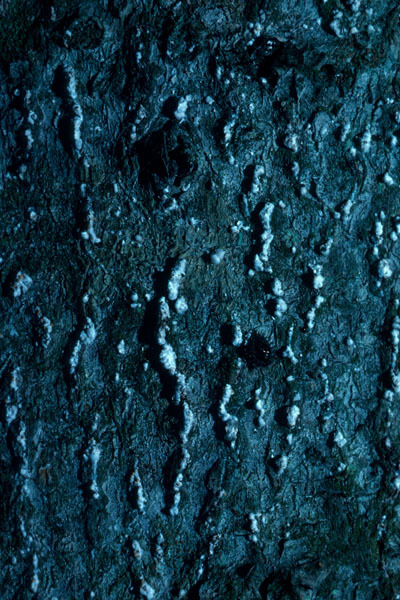 For instance, to prevent the dissemination of scales, a strong jet of water or a soft brush can be used to remove the insects from the bark (CCDMD 2009). An organophosphate insecticide should be sprayed on the bole and main branches in September or October to kill the crawler stage of the beech scale (Abgrall and Sautrenon 1991; Houston and O'Brien 1983) and lime sulphur can be applied as a spray in the spring (Rose and Lindquist 1982). These are effective treatments that have been used for many years on individual trees in Europe and North America.Products registered in Canada for the control of scales in general, on ornamental trees, contain the following active ingredients: malathion or calcium polysulphide. A ladybird beetle, Chilocorus stigma, feeds on the beech scale (Houston and O'Brien 1983). In 1986, Baylac studied the potential of using a predator named Lestodiplosis sp. In spite of the hopes that Houston (1983) had for biological control, there appear to be no viable biocontrol options for the beech scale at present. Advances in biological control will require that research be directed at predators and parasites that occur in the regions of origin of beech scale, that is, in northern Greece and Iran, in the Caucasus and in the watershed of the Black Sea (Gwiazdowski 2006). Control trials with the entomopathogène Lecanicium muscarinum have demonstrated its pathogenicity against the beech scale. However, other researches are needed before it can be used in the natural environment Laflamme et al. 2009). Beech trees that appear to have some resistance have been identified in Nova Scotia (Mielke et al. [ND]). However, less than 1% of beech harbour resistance to beech bark disease (Houston 1983, 2005). These trees appear to have lower nitrogen concentrations in their bark. Reduce the proportion of beech in the stand by first removing older trees with rough bark. When Neonectria faginata attacks begin, continue to reduce the proportion of beech in the stand and cut down all infected beech. Use herbicides to treat root sprouts produced by infected trees, but retain beech trees that show little or no damage. As the killing front advances, remove dead and dying beech and treat root sprouts with herbicides. Monitor stand health and retain beech that are resistant; they may represent less than 1% of the stand. 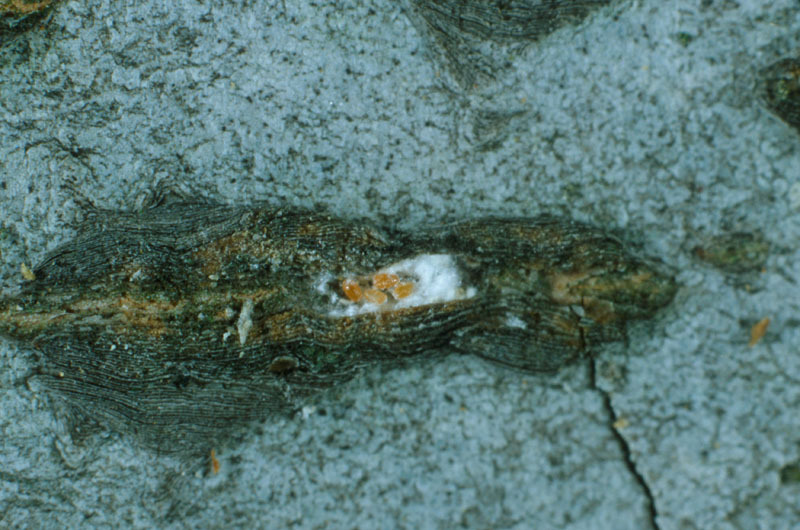 Scale-infested wood should not be moved to uninfested areas (McCullough et al. 2000). This is essentially a salvage cutting approach with the ultimate goal of increasing the proportion of disease-resistant beech (Houston 2005). Abgrall, J.F. et Soutrenon, A. 1991 La forêt et ses ennemis, 3ième édition. CEMAGREF Grenoble.399p. Baylac, M. 1986. 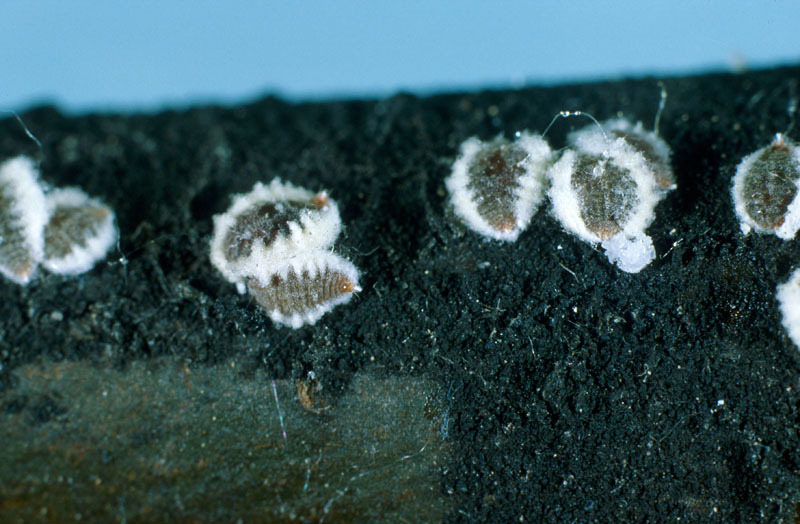 "Observations on the biology and ecology of Lestodiplosis sp. (Dipt. Cecidomyiidae), a predator on the beech scale Cryptococcus fagi (Hom. Coccoidea). / Observations sur la biologie et l'écologie de Lestodiplosis sp. (Dipt. Cecidomyiidae), prédateur de la cochenille du hêtre Cryptococcus fagi (Hom. Coccoidea). " Annales de la Société Entomologique de France 22, no. 3 (1986): 375-386. CAB Abstracts, EBSCOhost (accessed February 3, 2009). CCDMD 2009. Centre collégial de développement de matériel didactique. 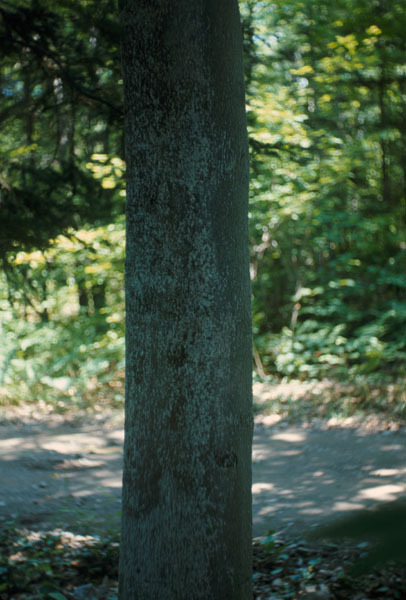 Maladies des arbres du Québec. http://rea.ccdmd.qc.ca/ri/arbres/# consulté le 3 février 2009. Gwiazdowski, Rodger A., Van Driesche, Roy G., Desnoyers, Adrienne, Lyon, Suzanne, Wu, San-an, Kamata, Naotoa, Normark, Benjamin B. 2006. "Possible geographic origin of beech scale, Cryptococcus fagisuga (Hemiptera: Eriococcidae), an invasive pest in North America." Biological Control 39, no. 1 : 9-18. Houston, D. R. 1983. "Developments in biological control of beech bark disease." 10th International Congress of Plant Protection 1983. Volume 3. Proceedings of a conference held at Brighton, England, 20-25 November, 1983. Plant protection for human welfare: 1035-1041. CAB Abstracts, EBSCOhost (accessed February 3, 2009). Houston, Dave R., O’Brien, James T. 1983. Beech Bark Disease. Forest Insect &Disease Leaflet 75. U.S. Department of Agriculture Forest Service. Houston, David R. 2005 Beech Bark Disease : 1934 to 2004 : What’s new since Ehrlich. In Evans, Celia A., Lucas, Jennifer A. and Twery, Mark J. 2005. Beech Bark Disease: Proceedings of the Beech Bark Disease Symposium. Gen. Tech. Rep. NE-331. Newtown Square PA, US. Department of Agriculture Forest Service, Northern Research Station p.2-13. Laflamme, G., S. Boudreault, R. Lavallee, M. Blais and J.-Y. Blanchette. 2009. Biological control trials of beech bark disease under laboratory conditions. SDU Faculty of Forestry Journal. 194-199.